What is the customs process in Bangladesh to import? How is import cargo released from Bangladesh Customs to importer? Who are the parties involved in import customs clearance formalities in Bangladesh? Import cargo clearance in Bangladesh Customs. The information provided here details on how to import goods to Bangladesh especially import customs clearance procedures in Bangladesh. The National Board of Revenue (NBR) is the apex authority for tax administration in Bangladesh. Bangladesh Customs is the official customs department of the country which works under NBR. All products imported into Bangladesh must be declared and duty is payable on them unless they are covered by an exemption or a suspension. It should to be given at customs office with other essential and important documents. For imported products into Bangladesh, shipping agents presents their manifest data electronically to the Customs authority. Once the Import General Manifest (IGM) is submitted on the web, the nominated C&F Agent (or the shipper himself) finishes the goods declaration i.e, Bill of Entry from their own premises and presents the products declaration to Customs systems through ASYCUDA World. The declaration or B/E has to be made in a particular format, known as Single Administrative Document (SAD). ASYCUDA is a computerised customs management framework which covers most overseas trade procedures. The framework handles manifests and customs declarations, accounting procedures, and transit and suspense procedures. ASYCUDA accommodates Electronic Data Interchange (EDI) amongst dealers and Customs utilising EDIFACT (Electronic Data Interchange for Administration, Commerce and Transport) rules. The ASYCUDA programme is coordinated at reforming the customs clearance process. What Customs formalities required to import in MONGLA.Import customs procedures required in Chittagong. 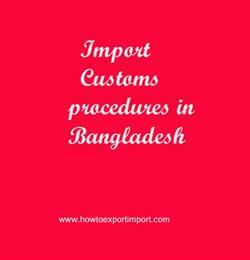 Import Customs process in Dhaka. Process to import to Sylhet. Requirements of customs to import to MONGLA. Customs requirements in Chittagong to import. Customs needed to import to Dhaka. How can I clear customs to import in Sylhet. How to import to India from Slovenia? How to export from India to Slovenia? How to export from Romania? How to Import to Romania? How to import to India from Romania? How to export from India to Romania? How to Import to Oman? How to import to India from Oman? How to export from India to Oman? How to export from Morocco? How to Import to Morocco? How to import to India from Morocco? How to export from Bangladesh? How to export from India to Bangladesh?